Todmorden Borough returned after an 11 week break with a stunning 5-1 home victory over Colne United in the East Lancashire League. Their first nine Division Two performances, following a switch from the West Lancashire League, were characterised by strong play in defence and midfield but no cutting edge in attack. All that changed at soggy Bellholme on Saturday when they carved out plenty of opportunities, aided by a sparkling debut from Jonny Sutcliffe up front. Sutcliffe and young Henry Antemes provided the pace and that enabled Ben Uttley to find his scoring form. Uttley bagged a hat-trick and Sutcliffe got the other two. Delighted boss Craig Milnes described Sutcliffe as “like a little whippet” in a match which only went ahead because the teams were desperate to play. Milnes said: “There was no standing water but it was lucky that we cut the pitch on Thursday ahead of more rain. Sutcliffe and Joe O’Connor were making their much delayed debuts and Milnes had 13 players but was without his captain, Josh Hiley, who is back at university. With next choice Jamie Stephenson on bench with a bit of a calf strain, Jamie Driver led the side. Milnes said his players had shown few signs of their long absence. “We played some really good stuff. We got the ball down and passed it,” he said. Sutcliffe opened the scoring when he lashed the ball home after 15 minutes. With Matthew Ormerod and Jack Dungworth in excellent form in central midfield, Borough doubled their lead when Sutcliffe set up Uttley. Colne’s ‘keeper was lucky to escape with a yellow card when he handled twice outside his area in quick succession to deny Sutcliffe. An Uttley free-kick rattled the bar and he had another effort come back off the angle. Sutcliffe made it 4-0, latching on to a ball over the top, running past the centre half and beating the ‘keeper. Tod’s final goal came when a defender headed the ball back, it hit a post and Uttley tapped in. Jackson Sutcliffe had offered to go in goal and the boss had promised to buy him a drink if he kept a clean sheet. All was going well for Sutcliffe entering the last 10 minutes until Borough conceded a penalty and the spot kick was smashed into the roof of net. Borough are up to sixth with 16 points from 10 games. 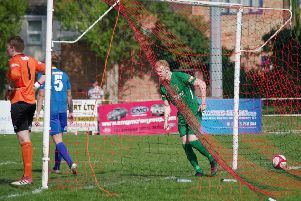 Milnes hopes Tod can keep up the good work at home to Blackburn United on Saturday but admitted the pitch was “a mess” after the Colne game and was too wet to work on at the start of the week. Blackburn are just below Tod in the table. Their home game against Rosegrove Railway last Saturday was off.